It’s Your Money So Take It Personally® – Excerpt – Remembering embarrassing early money lessons. It’s Your Money So Take It Personally® – Excerpt –Divorce and budgets and the early mindsets needed. It’s Your Money So Take It Personally® – Excerpt –The intrinsic value of a budget and first step to creating one. 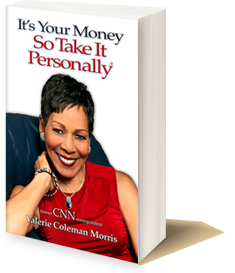 It’s Your Money So Take It Personally® – Book Excerpt 13 – Importance of generational wealth. It’s Your Money So Take It Personally® – Book Excerpt 14 – Generation lens for money: Gen Boomers, X, Y and Millennials. It’s Your Money So Take It Personally® – Book Excerpt 15 – Money decision triggers and building new money protocols among generations. It’s Your Money So Take It Personally® – Excerpt 16 – Importance of doable, incremental money goals. It’s Your Money So Take It Personally® – Excerpt 17 – How to approach your money game. It’s Your Money So Take It Personall®y – Excerpt 18 – Financial calendar to-do-list. Credit Score. Part 1 – The numbers and how to improve them. Credit Score. Part 2 – 80% of credit reports contain errors; what you need to do and not do. Credit Score. Part 3 – How secured credit cards can help your credit score. Back to basics – you can’t spend more than you make. How to figure out your monthly budget. How to teach children money smart skills? Make it fun and mental. Money basics: treat your money like oxygen – you need it to survive. Money basics: an exercise on how to ease anxiety before dealing with money issues. Money basics: how relieving stress fortifies your confidence about handling personal money. Understanding that money management is a marathon not a race. How the game of golf and money smarts are related. Benefits of combining fiscal fitness and physical fitness. Knowing the history of money will help you better appreciate your money’s future. Capitalism – what it is and why it is not a dirty word! Money mantras (reminders) and how they help you stay disciplined. Reiteration/repetition is good training and mantras help you do that. Mantras are prophylactics against unprotected spending. Social changes impact family money; different strokes for different generations. Family money: growing wealth versus attaining wealth quickly. Why lottery winners aren’t always lucky. What you need to have before you consider investing. Why saving for retirement in your 20s is smart. Getting financially literate – incrementally. Money mistakes are mi$$ed takes. Personal money management is one of a kind yours. The most common money dilemma is talking about it; taboo in some cultures. A little humor for saving your assets. How to talk to our elders and parents about their money. My story. Long distance elder care giving. Pt 1 – How to talk about and get their important financial information. How to talk to elders about their money needs. Pt 1-Icebreakers. How to talk to elders about their money needs. Pt 2-Knowing their wishes and having their estate plan. How to talk to elders about their moneyneeds. Pt 3-Common denominators help. Why everyone needs an estate plan. A reverse mortgage: good for elderly parents – a challenge for some adult children. The importance of having “an accomplice” – a backup person – to help carry out your elders’ estate plans. Create an estate plan mindset for all generations in your family. Learning from an early age how to assess self-worth. Knowing your self-worth takes focus. Importance of investing in your future – incrementally. Teaching young children the concept of paying yourself first. The $10,000 question: save for retirement or your child’s education? Preparing financially for your retirement and your children education: save for both if possible but save for retirement if you can’t! Don’t beat yourself up for past money mistakes – instead, embrace a second chance money mindset. The importance of talking finances before becoming a fiancée. Wedding bells should ring some financial bells and conversation. Talk about money issues before marriage – or fight about them after. Money characteristics that are shared by women. The importance of couples being of the same economic mindset. How the lack of money understanding gets magnified in relationships. Love and marriage/committed relationship: why being truthful about money is crucial before commingling it. Love and marriage/committed relationship: reveal each other’s money history before getting married – tough but necessary. Love and marriage/committed relationship: importance of knowing what kind of saver you are. What do couples need to know about money to make it work for them. Shifts in thinking about money as you consider marriage. Couples and household money contributions. Term life insurance and why/how it protects your family. Money and divorce: the importance of pre-marital counseling about money. Facing divorce: set and understand your personal end goal. Adjusting and adapting to money issues after divorce. Maintaining your own financial identity before and during marriage – helps if there’s a divorce. Three important questions a young couple should ask an attorney before they get married; and the most overlooked tax issue. Estate planning mindset needed for young couples or divorcing couples. An estate planning attorney answers. How to transfer assets in a second marriage if you have children from a previous relationship. An estate planning attorney answers. Plans. Part 1 – What they are and what they do. A story about early money education: who is responsible and what responsibility is. A story about the importance of teaching small children the difference between wants and needs. How to use everyday tasks to teach kids the importance of numbers. Children and allowances. Part 1 – Why they can be beneficial. Children and allowances. Part 2 – To give or not to give and how to compensate ‘tweens (kids 8-12). Rites of passage as children age – should include money lessons and warnings. Tweens 8-12 year olds Part 1: Why they’re not ready to make responsible money choices. Tweens 8-12 year olds Part 3: Why it’s important that they earn an income. Tweens 8-12 year olds. Part 4 – Why monthly family money meetings are good. The presumptive (entitled) money mindset of many college students. Teens and plastic – a prime example of unprotected spending and potential bad habits for younger siblings. All credit cards are not bad for college students; take a look at prepaid cards. Prepaid cards are good for controlling spending but beware of their fees. Money issues among family members can forever alter relations – so encourage a thrifty, meaningful money mindset for your children. Money, rites of passage and coming of age – responsibilities. Good debt versus bad debt: student loans are good debt, credit cards are bad debt. A young person’s personal money story and how they worked to recover. A young person’s personal money story and recovery from debt. A young person’s personal money story and the structure she set up to maintain her recovery. Why a budget must be your new best friend; how to create one easily. Why getting a budget helps you get a grip on debit and credit card use and debt. Parents to adult kids: credit card debt realities. Ground rules for boomerang adult kids returning home. Rules of engagement for parents with boomerang adult kids coming home. My personal story about finding unclaimed money. Pt 1. My personal story about finding unclaimed money. Pt 2. My personal unclaimed assets story: college memories about “emotional” assets add up. My personal unclaimed assets story: how I got 100 shares of stock and stock racism experiences. My personal unclaimed assets story: the value of “owning your experiences”. Sharing personal money experiences – how easy it is to forget assets from early life. What 20-somethings need to have before investing and how dollar-cost averaging is a good way to start. Military families and money management. Military money matters: 2003 legislation regarding active service and unique. Why former Moneyline host Lou Dobbs is a financial asset in my career. The story of Madam C.J. Walker – the first African-American millionaire. A story about spending wisely and saving wildly. Tips on getting an authentic, sustainable financial life plan. Why young adults need to look at retirement planning as having financial foresight. 30-39 years of age = the fourth decade of life and new money decisions. Right-sizing can be a huge asset for baby boomers..
Family transitions reveal family emotional assets. Discuss elder money management when everyone’s healthy. How to have financial “what-if” conversations with elderly parents. How to have a conversation with elders about their money management and needs. Pt 2. Entrepreneur versus intrapreneur – valuing the differences. Entrepreneur versus intrapreneur – encore career mindset. A growing trend with value: universities offering classes for elders. An elder’s story and legacy: founder of the first senior center in the world. Elders and very young children: good companions with very different needs. And the first inter-generational centers. The money implications when you become suddenly single through divorce or widowhood. Dealing with the bureaucracy related to the death of a loved one. The business of death and dying: heal emotionally before tackling the bureaucracy of your loved ones’ estate. Geriatric specialists. Pt 1. An important member of your elder care support team. Geriatric specialists. Pt 2. The services they offer. Geriatric specialists. Pt 3. Provide help following the death of a loved elder. Having your end of life wishes made known – it takes some work; here’s what’s needed. Divorce. You’re suddenly single. What’s your money plan? Divorce and money. Tax attorney’s basic advice; separation and recalculating money rules. Divorce and money. 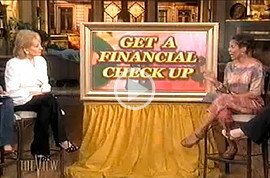 Redefining financial relationships – you must got there; a psychologist’s advice. Divorce and money. Separated and considering divorce – talk rules new money rules.